Prior to the late 1800’s, education was a private practice that took place in private institutions or through home schooling. 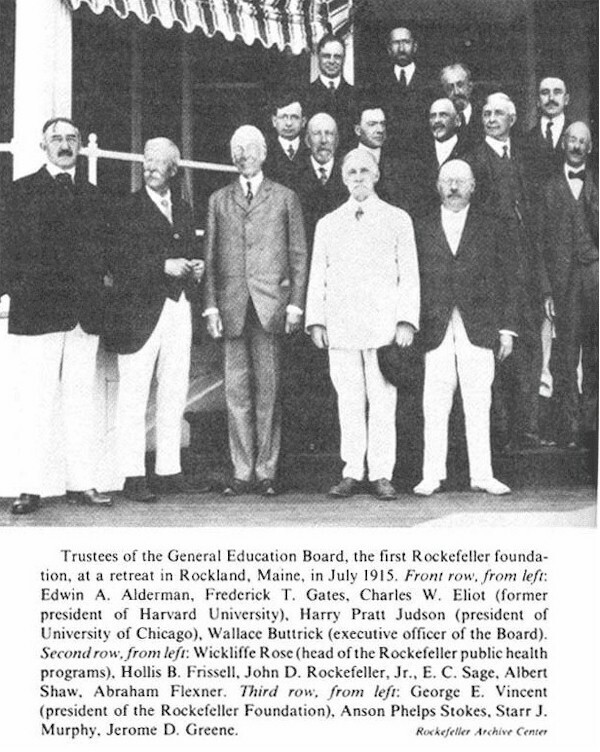 That all changed in 1902 when John D. Rockefeller created the general education board in conjunction with Frederick T. Gates. Frederick T. Gates was a close friend, business and personal advisor to Rockefeller. 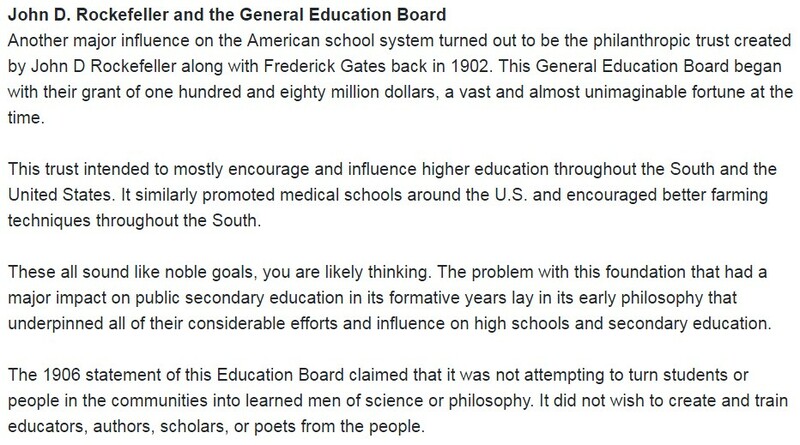 The general education board was responsible for funding the American public school system, and provided over one hundred million dollars in 1902 while continuing their support beyond 1902. 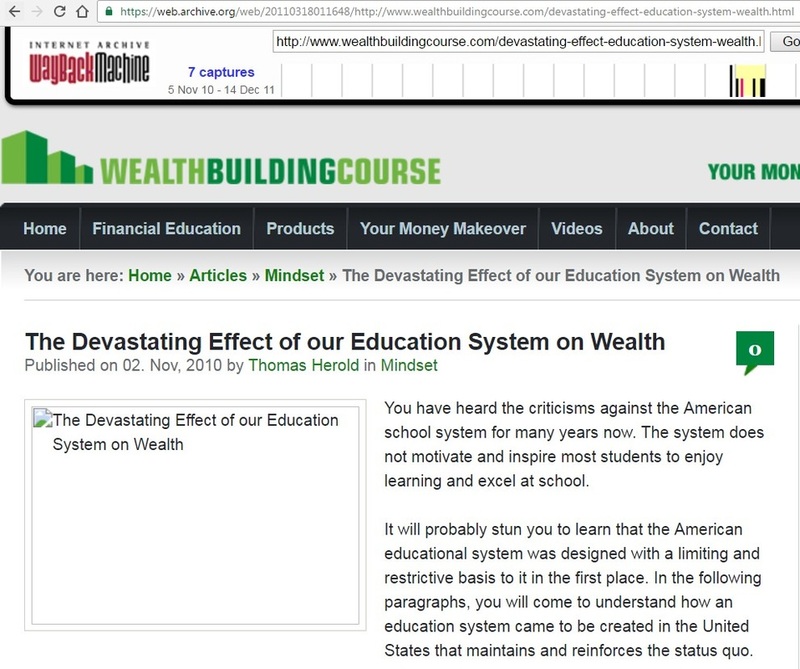 If we follow the money, the general education board was responsible for the creation of the American public school system. Does education not play a large role in manipulating the consciousness of human beings? By consciousness manipulation I mean trying to influence the way that the human being perceives the environment around them. 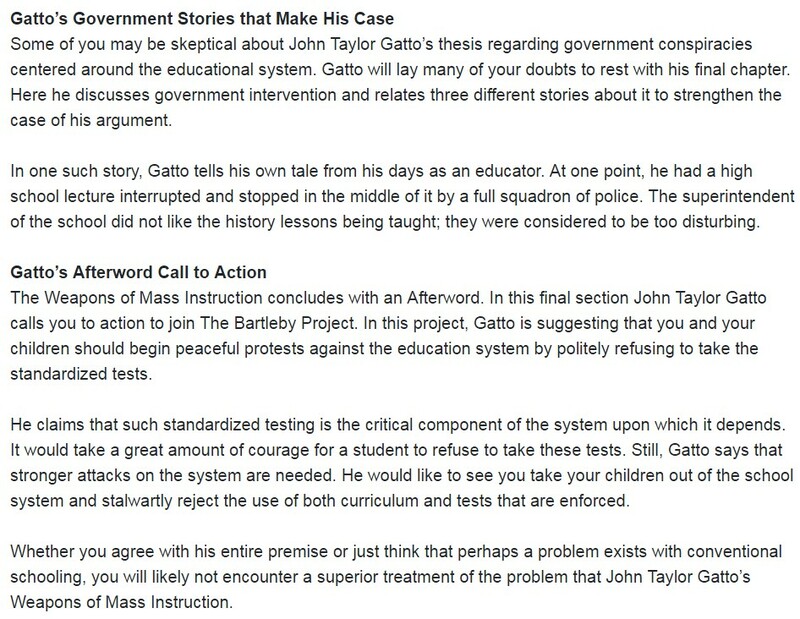 In order to implement this system, teachers need to teach, and somebody needs to teach the teachers, and somebody needs to teach them too. It’s time we start questioning the real purpose of education and who exactly is putting human beings through this system, and for what purpose? From an early age, we are forced into a mandatory school system that requires and encourages youth to attend for a large portion of their human life, for six hours a day. Each child is required to learn the accepted version of reality in order to fit into the specific mold desired by the elite. Just like television, a large part of school is simply programming. It’s ironic how the same families behind the funding are responsible for many inhumane atrocities that took place throughout history. They are also behind big oil, big pharma, food and other industries that are becoming more transparent as of late. Kids who do not fit into the system and do not resonate with it are usually labelled and medicated. Essentially, the whole point of school is to shape the reality of the student. We are taken from a very early age and put into the institution, from there we are shown how the world works and what we need to do to survive in it. School literally paints the perception that we need to do well in order to have a job so we can make money and pay our bills. It has nothing to do with the type of growth the human being needs. The concept of grades and marks do not signify any level of intelligence. In school we are shown the idea of an authority figure, how the world works and what intelligence is. 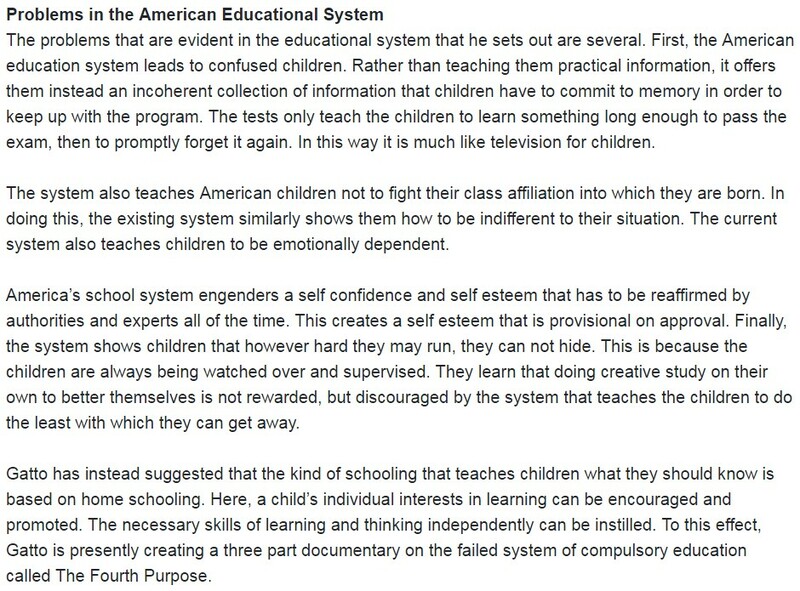 It seems homeschooling is much more likely to create a creative, adaptive, and forward thinking person who is less conditioned to think only within the small confines of a crumbling system. Does this mean it is for everyone and that one can’t turn out that way through standard education? No, simply the chances are far greater with homeschooling. 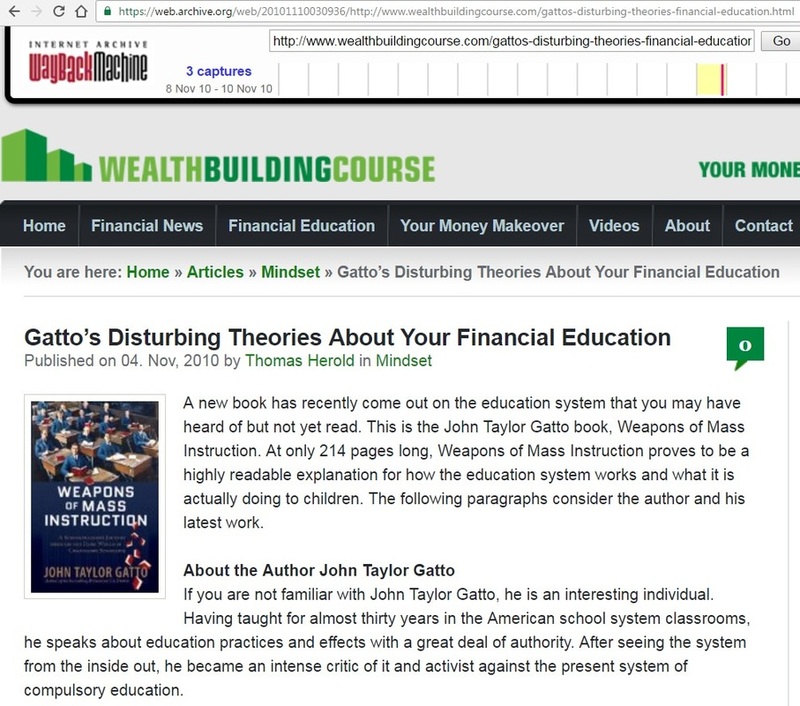 Check out Joe Martino’s TEDx talk about why education needs to change. Also check out Logan LaPlante’s Hacking Education (Homeschooling) TEDx talk as well. Up until the 1840’s, the American school system was mainly private, decentralized, and home schooling was common. Americans were well educated and literacy rates were high. At the ultimate cost of $129 million, the General Education Board provided major funding for schools across the nation and was very influential in shaping the current school system. ​The NEA is the largest labor union in the U.S., representing public school teachers and other school faculty and staff. It generally opposes merit pay, school vouchers, accountability reforms, and more. 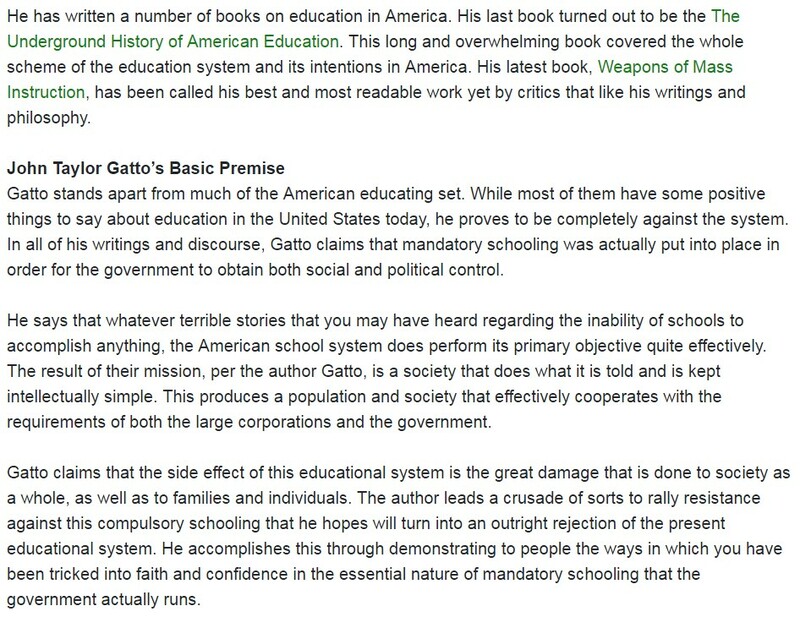 ​This laid the groundwork for education reform and the schooling system we have today. ​The National Assessment of Adult Literacy (NAAL) administered tests which revealed 14% of US residents would have extreme difficulty with reading and written comprehension. In 2003, some 30 million American adults had Below Basic prose literacy, 27 million had Below Basic document literacy, and 46 million had Below Basic quantitative literacy. 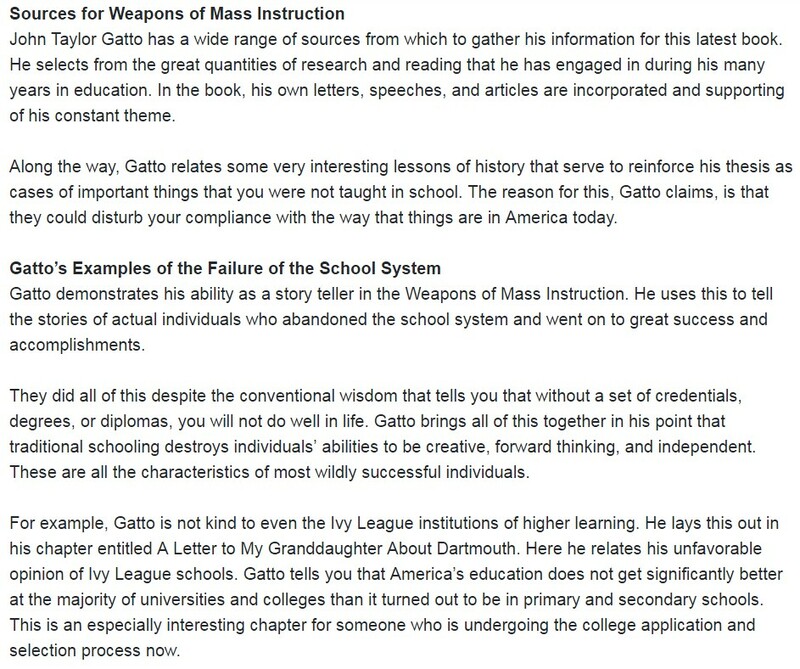 Frederick T. Gates, “The Country School of Tomorrow,” Occasional Papers, no.1 (New York: General Education Board, 1913), p. 6. Author of "World Without Cancer: The Story of Vitamin B–17"